Rock Spring Farm (plein air). 10x8, oil on linen panel. 2015. Today's paint out was at Rock Spring Farm which is right in the center of Leesburg, VA. It's a great location and there was no shortage of material to paint. 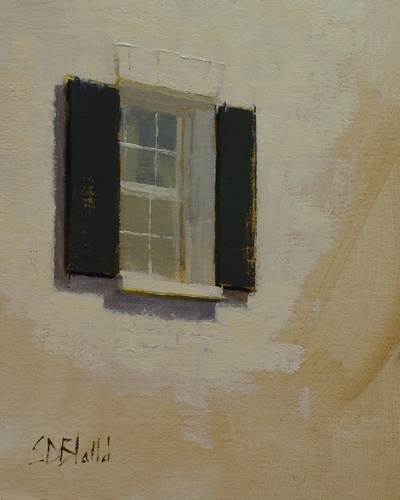 so naturally I settled on painting a window on the old house - I think I just needed a break from the greens for a week or so. Even though the finished sketch is nearly monochromatic I managed to use a fairly large palette of white, ivory black, ultramarine, burnt sienna, bright red, cad yellow light and yellow ochre. To make things harder I didn't keep enough values back to let me paint highlights on the whites. My workaround was to increase the paint thickness in a few places to catch the light.